Culms compressed-terete, grooved, to 40 cm high and to 0.7 mm diam. Spikelets globose to ovoid, to 5 mm long. Glumes very obtuse, faintly keeled, 1.6–2 mm long, straw-coloured tinged red-brown. 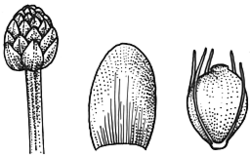 Bristles 6–8, usually as long as or somewhat longer than nut. Stamens 2 or 3; anthers 0.4–0.7 mm long. Style 2-fid. Nut biconvex with faintly ribbed angles, obovoid, c. 1 mm long, c. 0.8 mm wide, shining, black; style base about one fifth as long as and about a third as broad as nut. Distribution and occurrence: Coast north from Myall Lakes; sporadic. Also Queensland, Northern Territory, South Australia and Western Australia; pantropical. Grows on sandy shores of coastal lakes.